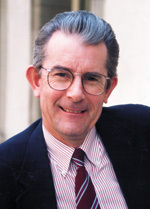 Professor Christopher E. Brennen was born in Belfast, Northern Irelend and received his bachelor's, master's, and doctoral degrees in Engineering Science at the University of Oxford. He has been a member of the faculty at Caltech for more than 40 years and has published numerous papers and books in a wide variety of topics involving fluid mechanics. Well known for his work on cavitation, on turbomachinery flows, and on multiphase flow, he has received many awards for his scholarship - the only person to be awarded the top prize of the Fluids Engineering Divisions of both ASME and JSME - and for his teaching at Caltech. He has also served as both Dean of Students and Vice President of Student Affairs at Caltech. A symposium and banquet honoring Professor Brennen on the occasion of his retirement from the California Institite of Technology was held on Friday, March 19, 2010, on the Caltech campus. The symposium included presentations by distinguished scientists and engineers that Professor Brennen has mentored during his tenure at Caltech.